Argo Launch! The Challenge of 296,000 Light Years! Production notes: The original credits indicated that Noboru Ishiguro and Leiji Matsumoto both worked on the storyboard for this episode, but in reality it was entirely Ishiguro’s work. There’s a sort of gaffe in the original Japanese intro; Iscandar and Gamilas are shown together–and labeled with their proper names. Anyone who remembered this as the series went on would have known long before the ship’s crew that they were twin planets. Ganz, the commander of the Gamilon base on Pluto, watches as a huge Earth battleship destroys his high speed carrier (see last episode). Leader Desslok tells him not to concern himself with it. Nevertheless, Ganz asks for and receives permission to use the battleship as a target for their new giant missile, the Ultra-Menace Missile. I guess “Ultra-Menace Missile” is a better name than “Giant Rocket-Powered Flying Doorknob”, which is kind of what it looks like. The Japanese name was simply “Super Large Missile”, which I’ve been assured sounds much cooler in Japanese than the translation would indicate. There’s an obvious mistake in this scene. Illustrious Leader Desslok tells Ganz “our Pluto Base on Gamilon has nothing to fear from this old wreck”. Technically, Desslok is correct. Their Pluto Base on Gamilon isn’t at risk, because there is no such thing. He meant to say “Gamilon Base on Pluto.” There was a shot of the Pluto base and a title card for it in Yamato. When it was removed from Star Blazers, they seem to have neglected to edit the underlying audio track. If you listen closely as the missile is being raised, you’ll notice that the sound is off by a few seconds. Additional note from Matt Murray: There’s another audio goof here, probably unique in the series: you can still hear the original Japanese audio track when Ganz is counting down to the launch of the missile. It comes about a half second ahead of the English countdown, and sounds a bit like a premature echo. It’s during the Captain’s speech that the Yamato is renamed the Argo. I don’t know who came up with the name, but Argo is a very apt choice. From Greek legend, the Argo was a ship that went on an important and perilous journey to fetch the Golden Fleece, similar to Yamato‘s journey to retrieve the Cosmo DNA. It also had the divine assistance of the goddess Hera, similar to how the space battleship has a benefactor in the “goddess” Starsha. Thematically, the name is perfect. The name change was done, of course, for political reasons–we can’t have the name of our hero ship on an American children’s TV show (in 1979 at least) be the name of a ship that American soldiers fought against a mere 35 years previously. I remember one fan of Star Blazers mentioning that he was glad they changed the name–his Pacific theater veteran grandfather would never have allowed him to watch a show about the Yamato. Fortunately, they at least make it clear in the first 2 episodes that the Yamato is the basis for the ship. Name changes were not limited to the American market; most countries that imported Star Blazers knew the ship as the Argo, except in Spain and Latin America, where it was called Intrepido (“Intrepid”). Speaking of names, we get a whole boatload of them here (pun sort of intended). About the names, yes, they tend to be corny. Wildstar, Nova, Orion (and it is spelled “Orion,” not “O’Ryan”), etc., were probably crafted to latch on to the zeitgeist of the newly-minted Star Wars phenomenon. I would have (even back then) preferred more traditional names. Production note: the original Japanese character names were more common than it might seem to outside ears. Kodai Susumu was named after Leiji Matsumoto’s brother Susumu. “Kodai” is the Japanese word for “Tradition.” Kodai Mamoru translates literally to “Tradition Protector.” Mori Yuki (which translates to “Forest Snow”) was named after a girl Matsumoto met in college. Okita Jyuzo was named after SF author Jyuza Unno. And the list goes on. Most of the Star Blazers characters originally only had one name. Alex and Derek Wildstar and Mark Venture were the only ones to get first and last names. Later, Glitchman was created as Homer’s last name by Peter Fernandez and his crew, who dubbed the third series. The rest of the names weren’t filled out until later years, all in Star Blazers comic books written by Americans. Hardy revealed his given name, Jefferson, in the second series by Comico written by Markalan Joplin. The rest got their due in Argo Press’s Star Blazers Perfect Album in the nineties. These full names were bestowed by writer Bruce Lewis. Frankly, I was glad to see them receive full names. They have first and last names in Yamato, after all. So, during Avatar’s speech, we’re (re)introduced to Derek Wildstar, Mark Venture, Patrick J. Orion, Stephen Sandor, Nova Forrester, IQ-9, and Abraham Avatar. Production notes: color errors abound in early episodes, so we can’t take this too seriously, but there are several other combinations in the assemblage including Brown on white. We never see it again, which means it was either discarded by the animators, or those guys just never came up for air from wherever they were working. The bilges, perhaps? Lots of error-preventing decisions had to be made on the fly in the early episodes, and one of them involved the characters’ gloves. In the first two episodes, they were white with no detail, which caused them to sometimes be mispainted as flesh. As of episode 3, they were redesigned with a vent on the back of the hand and designated brown instead of white. Given the state of the Earth forces, it’s highly likely that military service was mandatory. This is seen today in several nations, and would be a necessity in the war against Gamilon. So the Star Force is a military unit, taken from the best and brightest on Earth, which effectively acts as a special forces unit. As in real-life special forces units, they are trained for long, arduous missions behind enemy lines. And since they operate outside normal military boundaries, regulations on hair length and standards of address is more relaxed than a typical military unit, at the discretion of their CO.
Additional note from Matt Murray: As a kid watching this series, I initially thought the name “Star Force” sounded a bit hokey until I remembered that we do have an actual branch of the military dubbed the Air Force. In Russia (as well as in numerous fictional contexts), the branch of the military concerned with space launches was known as the Space Force. So the name “Star Force” for the first crew to head into interstellar space seems a logical progression. The Star Force is cheered on as they parade through the underground city on their way to the Argo. Well, mostly cheered. There are some jeers from a man who asks “Who’s going to protect your families while you’re gone?” In Yamato, the concern from some spectators wasn’t about the families left behind, but about the Yamato crew escaping Earth, leaving everyone else to die. Given the space battleship’s original designation as an “escape ship,” that’s not unreasonable. While the crew says goodbye to their families, headquarters has spotted the missile and determined that its target is the Argo. That Ultra-Menace Missile sure can move. Just one day after the battleship surfaces, it has crossed billions of kilometers to reach Earth. The crew is transported by aircar the rest of the way to the ship. There’s a brief shot of the aircars going down the transport tube that was edited out of Star Blazers, most likely for time constraints. (If you listen to the music, you can hear where it’s edited.) Captain Avatar is notified that the entire crew has reported in, there were no drop-outs along the way. In Yamato, he specifically told the crew to drop out during the parade if they decided not to go. Homer Glitchman, Communication officer “assigned to Venture.” I’m not sure why he is assigned to Venture. According to his uniform colors, he should be reporting to Nova. Christopher Eager, assistant pilot under Venture. Although he describes himself here as “assistant pilot”, he rarely takes over the helm when Venture’s out. His position seems to be more “assistant” than “pilot”, specifically enemy detection and evasion. There are two remarkable things about Eager: 1) his distinctive “Gomer Pyle” accent, and 2) the size of his belly. It’s amazing that with Earth in such poor condition, he managed to stay well-fed. The Captain arrives and soon starts an inspection tour of the ship with Wildstar and Venture. There’s another brief scene that was edited out here as they leave the bridge. In Yamato, the camera pans over to the main video panel and a simple blueprint of the ship comes up. This blueprint is referred to periodically as the tour goes from station to station. One of the tour’s first stops is the “Wave-Motion Gun room and the Missile Firing Room”, but I think this same room is later identified as the Mainframe Computer Room. Next stop is the firing gate of the Wave-Motion Gun, a huge hole cut into the bow of the ship. As the trio stand in the gate, looking over the dried seabed, there are brief flashback scenes of the original Yamato in battle (re-used from episode 2 with a new music mix never released commercially). 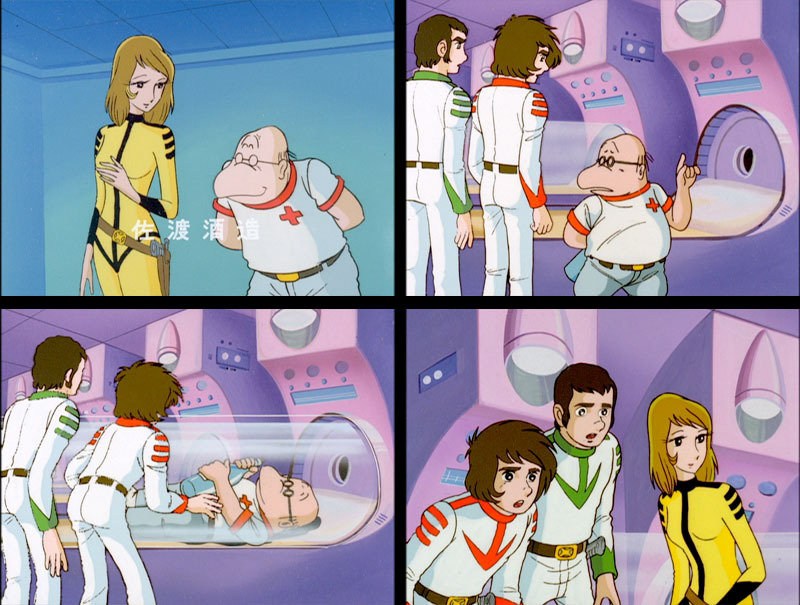 As before, these scenes were cut from Star Blazers. Production note: The scene of Captain Avatar, Wildstar, and Venture standing unprotected in the mouth of the Wave-Motion Gun has been the subject of fan speculation since its original broadcast. Those who struggled to explain it came up with the concept of an invisible air-barrier. The breeze was caused by the unequal pressure between the interior and exterior. Besides, it made for a dramatic shot. Next Wildstar and Venture are reintroduced to Nova, leader of the Living Conditions group. Dr. Sakezo Sane’s intro is supposed to be next, but it was left out of Star Blazers. What happens in this missing scene is the “great Dr. Sado (Sane)” introduces the sleep-tubes, which are meant to put people in cryogenic sleep during long journeys (probably a left-over from the space battleship’s former role as an escape ship.) He demonstrates by jumping into one (with an ever-present bottle of sake) and going to sleep. It’s this sleep tube that he’s woken up from in the next episode. Continuing on, Nova shows Wildstar and Venture the Holography Room, which uses 3-D images and environment controls to replicate life on Earth. Starting with a beach scene, at the press of a button it becomes a snowscape. While this room calls to mind Star Trek‘s holodeck (introduced in 1973’s Star Trek animated series), there’s one crucial difference–the Argo‘s Holography Room actually works! It doesn’t go on the fritz and become a threat every other episode! Next is the lab and design shop, where Chief Science Officer Stephen Sandor shows them a machine that can construct a small vehicle in seconds. Supposedly, it’s machines like this that allow his crew to quickly repair any damages to the ship. I imagine they feed in raw material, program the machine for the panel or part needs replacing, and it reshapes it to what is needed. I’m not sure if this was intended, but it’s interesting to note that the vehicle Sandor makes is a child’s “Astro Cycle”. It’s eventually revealed that he was maimed as a boy while driving a similar vehicle. The hangar is next, and then the last stop is the engine room and a visit with Patrick Orion, the elderly Chief Engine Room operator. He explains to Venture briefly how the Wave-Motion Engine works; it compresses space dust into tachyons, allowing the ship to jump through space. The Captain announces that the tour is over. As he heads toward the door, he overhears Wildstar questioning Orion about his character, which ends with Derek all but blaming the death of his brother on Avatar. Orion gives the young Wildstar some perspective, revealing that Avatar’s only son died at the Pluto battle as well. At this, the Captain steps out of the door. This is a fairly key moment in Wildstar and Avatar’s relationship, as it begins to resolve the animosity Wildstar felt toward Avatar, clearing the way for the Father/Son type bond we see later. Wildstar arrives on the bridge and is informed of the incoming enemy missile. He rushes off to report to the Captain. He interrupts Avatar, who was sitting at his desk looking at something, which he hurriedly tries to put away. After Avatar leaves, Wildstar sees what he was looking at: a picture of his son is left hanging out of the desk drawer. There’s a woman in the picture as well, but as far as I know, she has never been identified. Maybe Avatar has or had a young wife? On the bridge, the Engine has been charged to 100%. Venture announces he’s about to start the main engine, when Avatar commands him to stop. “The engine has to start with a single coordinated motion. If it doesn’t, the power surge will shake us to pieces.” He then tells Orion to give them a surplus energy charge. The engine is soon charged to 3000%, Venture hits the switch and… silence. Space Battleship Yamato draws this scene out a bit longer; Star Blazers was shortened here by several seconds. Avatar tells Venture to go over his checklist again, and this time, as Mark is repeating the steps, he realizes one of the auxiliary switches was off. Just an observation about Venture–for someone in such an important position, he doesn’t seem to know a lot about his job. Avatar had to explain energy build-up to him, he was flabbergasted by Orion’s simplistic Wave-Motion description, he almost destroys the ship by starting it improperly, and now there’s a little gaffe here when he forgot to hit one of the switches. Either he was sleeping during his training, or someone’s not giving him key information. There was enough drama in this episode without making him look like an idiot, IMO. And if you’re wondering why it’s such a big deal to get the engine started when the ship seemed perfectly capable of moving around last episode, note that in the last episode they only used the Auxiliary Engines. With the Auxiliaries, they could move and fire the guns, and maybe even travel out into space, but they needed the Main (Wave-Motion) Engine to move at full speed and, more importantly, go to warp. Without warping, the mission wouldn’t have any hope of success. In Yamato, Okita also mentions to Kodai that the Wave-Motion Engine was needed to fully power the main guns. Getting the charge to 3000% again, Venture hits the switch and… more silence! Then slowly, we hear the sound of the engine humming, getting louder and louder. This is artfully timed to match an extreme closeup of Avatar looking unusually tense, as if he is coaxing the mighty ship to life by sheer force of will. As the crew readies for launch, Wildstar prepares the main guns. The Argo takes off as the Ultra-Menace Missile is just minutes away. They position the ship, lock the main guns in place, and fire. Judging from the size of the explosion, the missile isn’t simply destroyed, the shock cannon blast causes it to detonate. Production note: this was actually a rather notorious scene that got Director Noboru Ishiguro in a lot of trouble. Despite the impossible schedule, he was always on the lookout for a chance to try something unusual, and this scene fit the bill–a tricky double-exposure of the ship growing in size while the background receded. It took an entire day to shoot and cost far more than a normal scene. Ishiguro has said that Producer Nishizaki came close to firing him over it, but the lack of any qualified replacements probably saved his bacon. Naturally, this scene went on to become a classic. The Argo spreads its wings for atmospheric flight. On the bridge, the crew starts to relax. Avatar looks at the young Wildstar, and thinks about how he would’ve made his brother proud. There are now 363 days left. This is my first contribution so please allow me to thank you for all the great stuff that you do. The first two seasons of Star Blazers were dubbed in Arabic in 1983 and introduced to the Arab world by a Jordanian company under the supervision of Mr. Bassam Hijjawi. The show was ground breaking in every aspect and is still held as a timeless classic under the name “Abtal Al Fada”, translated into “Space Heroes”. The Arabic version was unique in many ways. Largely based on Star Blazers rather than the original Japanese Yamato, the English names were kept intact. The intro consisted of the Yamato theme minus the song and was followed directly by the Red Scarf theme, again played without words, providing a rather long but memorable intro. The voice cast was just excellent and performed in official Arabic injecting a grandeur rarely found in cartoons. The Star Force is a living thing in the Arabic version. One very exciting and notable difference occurs in this episode: the ship is called the Yamato and there is no mention of the Argo… Avatar just calls the ship by its true name and this sticks until the end of the show. Ironically, the Arabic version which uses all the American names is closer to the Japanese origin than Star Blazers itself! It has the Yamato! In Arabic the infliction is slightly different though: Ya-maa-to! After 20 years the rights reverted back to the original owners and the show was dubbed again by an Egyptian/Syrian company. The production was sub-par and the names were changed to Arabic counterparts, but the main problem was the botched musical score. This is why the original Jordanian version is still held as the true interpretation of Star Battleship Yamato in Arabic.